The New HEKA Falcon incubator is a top-of-the-range HEKA product featuring our best control systems and a plastic cabinet. It allows you to provide your falcon eggs with precise optimum conditions in a controlled and consistent manner. This, combined with the practice of precise egg weighing will enable you to achieve outstanding results time and time again. It has fully automatic management of temperature, humidity and turning. Turning duration can be programmed from 10 to 120 minutes. A full turn (moving the tray from the front to the back) takes 30 minutes. The time between each turning cycle starting can be programmed from 10 to 360 minutes. Continuous turning can be achieved by programming the turning duration to be the same value as the time between each cycle. The distance travelled between the front and back of the machine is 46mm. For an egg of 35mm diameter, turning the egg 150 degrees. Temperature and Humidity are accurately and evenly distribution throughout the cabinet, along with air flow. This means that environment for each egg does not vary by position in the incubator, making it easier to ensure optimum conditions for all eggs. Humidity is precisely driven to the setting of your choice with accuracy of 1%. The humidity sensor is extremely accurate and is individually calibrated at the factory, to ensure absolute consistency across a set of incubators. This is particularly important if, like most falcon breeders, you operate multiple incubators set a different humidities so that you can choose the best humidity option for each egg based on its weight loss profile. 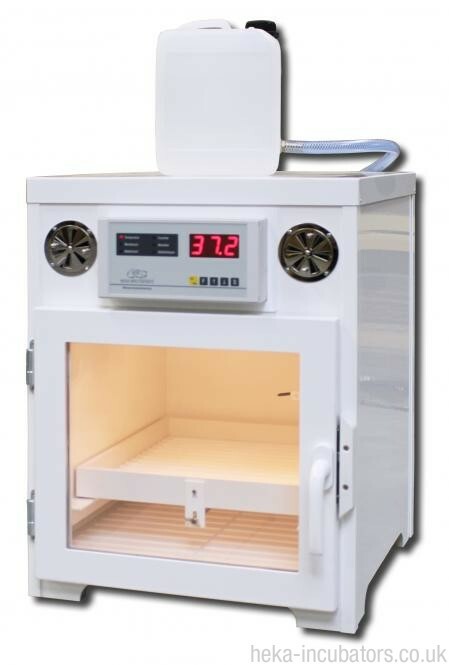 Note that the incubator can set humidities above ambient and cannot dehumidify. Convenience and Practicality: The turning rod is located beneath the tray to allow clear and easy access to the eggs. There is plenty of room above the tray which makes it easy to reach individual eggs for weighing, without taking the tray out of the incubator. Technology: The digital control the same as the Olympic series incubators, which is the top of the range control unit. The machine has a plastic insulated cabinet, the same as the Olympic series (top of the range). All the components are European sourced and top quality. Behind the incubator, there is a turning-motor (exterior, covered), which is connected with the trays by a push-rod and white connectors (powder-coated aluminium). The motor pushes and pulls the trays automatically forwards and backwards. Turning can be reprogrammed or deactivated by you for the hatching-phase. The incubator is equipped with a fully-automatic humidification system. It includes a water- canister, which is the water reservoir for the humidification. A float valve regulates the water supply from the canister to a water container with a heater. Every time while heating (continuously at heating up and in short impulses when set-temperature is reached), the water- heater is activated, which heats the water and evaporates it. The insulation value is much better in comparison with single glazing, and uses less energy. Also, insulated glazing does not begin to steam up until higher than ~80% humidity, and higher values are not normally required. The incubator is equipped with the following as standard; an interior light, a plastic incubating tray, a water canister and a detailed manual.